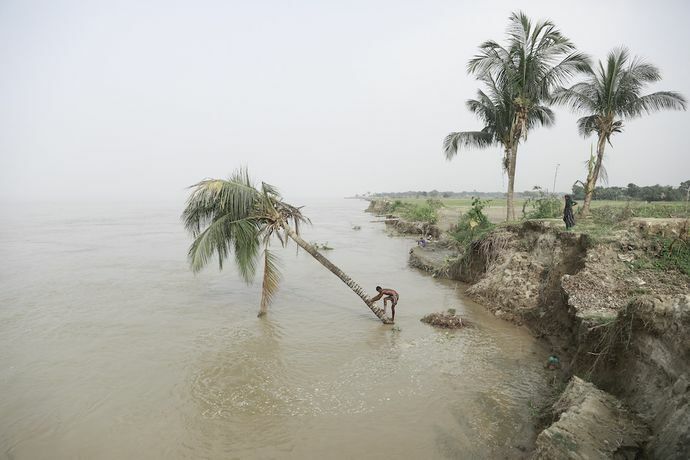 In Bangladesh, a delta landscape home to 164 million people, and with a growing capital approaching 20 million, many of our time´s most crucial issues are put to the test. The extensive migration to Dhaka has a direct link to the textile industry and the clothes we wear, a system that affects global warming and Bangladesh directly through violent monsoon rain and rising sea levels that devour its coastal strips. Lately, the country has also been associated with another human disaster; the persecution of the Rohingya people, which have forced about 700,000 people to leave Myanmar for Bangladesh. At the same time, Bangladesh is a country rich in diversity and culture. Being in the frontline of global change creates a rapid and dynamic development of culture, and especially an exciting contemporary art scene. With the exhibition Färgfabriken wants to show three artists from Bangladesh today. In common, they express both a local and a global now, with historical ties to the outside world. Yasmin Jahan Nupur, Munem Wasif and Suvra Kanti Das are three artists working in Dhaka, which all, in different ways, take the pulse of their country based on their own perspectives and stories.